As the solar revolution continues to grow, owners of condo, lofts, and townhomes felt left out because they usually had to battle their homeowners associations to add solar. Thanks to a change in California law, homeowners no longer have to get approval from the HOAs. All you have to do is search “HOA problems” to get more results than you could read in a lifetime. While rules on the appearance of buildings and surrounding property is a great way to ensure community standards, many times these rules can restrict people in ways that were never intended. Thanks to these new laws, California HOAs can’t obstruct solar installations on their properties. Under the new law, HOAs cannot prohibit solar installations. They must conform to the state solar policy. Here is quick summary of the law. If a condo owner wants to install solar panels on their own rooftop, adjacent garage, or carport, HOAs can no longer prohibit them or require a member vote for approval. If a condo owner wants to install solar panels onto a common rooftop, garage, or carport, the condo owners might require a solar site survey before the installations. The survey determines the breakdown of usable space among all homeowners sharing the area designated for potential solar hardware. This way the installation can be on a common roof, or covering a parking lot that everyone shares, for example. Everyone gets their own designated solar panels and even though they are all tied together, condo owners won’t end up paying for their neighbors’ electricity. The only case where the HOA could deny the solar installation is if the site survey determines that the rooftop solar system would be impractical or if space allocation is impossible. This law change will make solar adoption in condos far easier and more likely for these shared-space buildings. A good way to think of it is if half of the condo owners want to install solar panels on the property, and they have enough money and space for the project, then they can do it. The other owners don’t have to buy into the solar panels, but because of the shared cost and the obvious benefits, many of them will buy into the project, making the cost better for everyone. The market was already heading in this direction. Developers already build condos with solar panels, this law just speeds the process up and allows existing condo owners to join the solar revolution. It is important to understand that this new law does come with some requirements. Solar applicants in multifamily dwellings with common roof areas will likely have to notify each owner in the building of the proposed solar installation. If you share a roof with your neighbor, even though you have your own roof over your condo, you probably have to notify your neighbors that a solar panel installation is coming. Owners who apply for a solar installation through the HOA might also be required to have homeowner liability coverage. They would need to provide the HOA with proof of insurance within 14 days of approval, and they would need to show proof every year. The costs for damage to any common area resulting from installation, maintenance, repair, removal, or replacement of the solar installation. The costs for maintenance, repair, and replacement of the solar installation. The restoration of all common areas and separate interests if the solar system is removed. Disclosing the solar installation to prospective buyers and anyone related to the property. Right now is an exciting time for condo owners in California who feel they are missing the solar revolution. Solar is better, more powerful, and less expensive than ever. 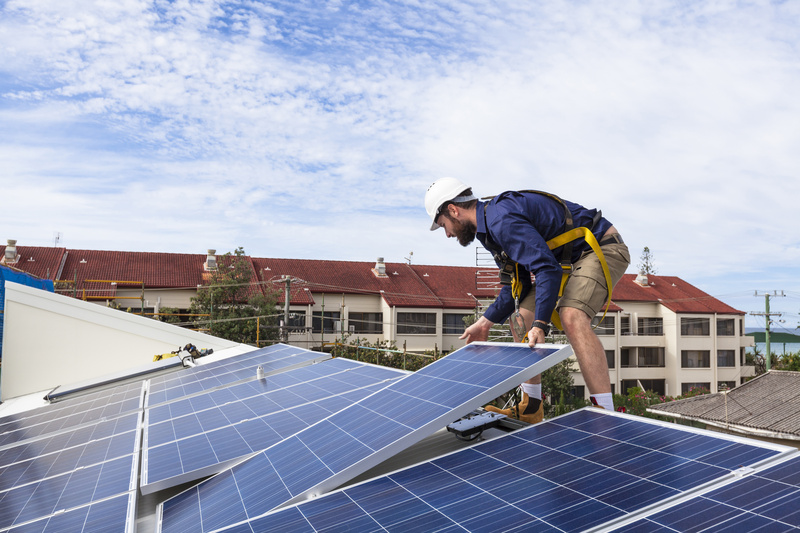 Now because it is extended to condo owners under the rule of homeowners associations, everyone who owns a condo or a townhome can enjoy the benefits of going solar. If you want more information, please visit us at HahaSmart and see how we can save condo owners money and guide them through the whole solar panel installation process. Howdy! Buy Solar Panels Online in Australia for Affordable Residential, office, shop and commercial spaces at lowest price. Call +61 130-044-7022 for installing solar.